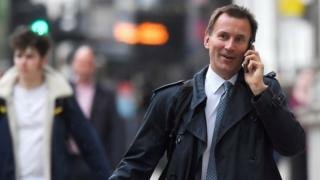 The parliamentary watchdog has launched an investigation into Jeremy Hunt after he delayed declaring his property interests to Companies House. The health secretary apologised after it was revealed he had taken six months to register his 50% interest in the company Mare Pond Properties. His spokesman called it an "honest administrative mistake". And the Cabinet Office said there had been no breach of the ministerial code. A spokeswoman for the office of the parliamentary commissioner for standards confirmed it was looking into an alleged breach of paragraph 13 of the MPs' code of conduct in regards to Mr Hunt. Paragraph 13 states: "Members shall fulfil conscientiously the requirements of the House in respect of the registration of interests in the Register of Members' Financial Interests. "They shall always be open and frank in drawing attention to any relevant interest in any proceeding of the House or its committees, and in any communications with ministers, members, public officials or public office holders." The Telegraph said Mr Hunt had set up Mare Pond Properties in 2017 with his wife to buy seven flats in the Ocean Village development in Southampton. His spokesman said the minister's accountant had made an error in the Companies House filing, which had been "a genuine oversight." However, Mr Hunt accepted the mistakes had been "his responsibility" and apologised. A Downing Street spokesman said it was right that the minister had said sorry, but agreed with the Cabinet Office that there had been no breach of the ministerial code. "We consider the matter closed," he added. But Labour's shadow secretary for the Cabinet Office, Jon Trickett, said Mr Hunt's behaviour had been "simply unacceptable". His party then referred the incident to the commissioner.